From the Forums is a great way to see what all of the current hot topics are on the TiPb forums. Today we would like to go over some of the popular sub-forums for those of you who may not be familiar with our forum setup. Becoming a member is fast and free, so if you have not already already done so, head on over and register now. Yes, Facebook 3.1 is still a hot topic. So has their application gotten any better for you? Let us know! 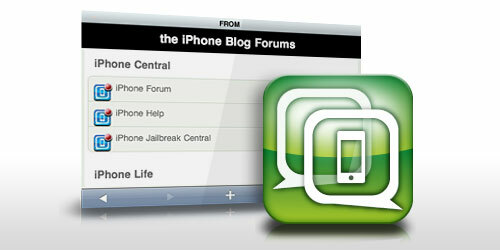 Crackberry Kevin has been lurking within our forums in search of some iPhone help. If you could, please visit his thread to lend him a helping hand and you mau just win a new device. We are all aware of the hype that surrounded the Google/HTC Nexus One Android device and so far... it's turned out to be nothing but trouble with it's spotty 3G and disappointing in terms of overall sales. Do any of you really still feel this device poses a threat to Apple's iPhone?